The 2000 series reefer models share many of their body details with the 1000 series box cars, and 3000 series stock cars. The roofs, car ends and sills are identical on all three models. Refrigerator cars, also known as reefers, are a specialized type of boxcar used to transport perishables. In the early days of railroading, reefers were cooled with blocks of ice. Today's modern reefers are cooled by mechanical refrigeration systems. Since not all fruit & produce require refrigeration, (some need only fresh air) another specialized boxcar group was created. These cars are called Ventilated boxcars and are equipped with vents and shutters on each end, and/or open barred doors to allow for air circulation. 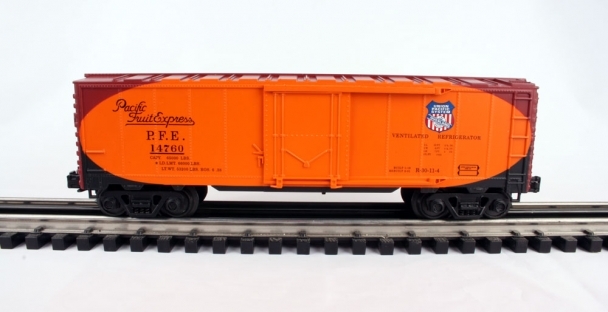 Ventilated boxcars were used into the 1960s.